Cloudberry is a perennial. Like willow plants, cloudberry has male and female plants. They usually grow between 6 and 20 centimetres high. Cloudberry has an extensive creeping and branching system of slender woody rhizomes covered with brownish papery bark. In Scandinavia, cloudberries are used to make a liqueur. They are also blended with large quantities of whipped cream to make a delicious dessert. In Alaska, people make a mixture of seal oil and chewed caribou tallow, and beat this until it is like whipped cream. They then add cloudberries to make "Eskimo ice cream." There are many medicinal uses for cloudberry. The Dogrib would boil the flowers to make tea and put it on sore eyes. They would also put chewed berries on wounds and sores. The Inuit had many names for this plant and its parts. 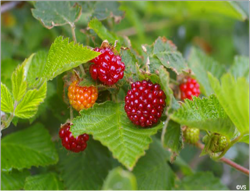 Before they had berries, the plants were called aqpiqutit, while in the spring, before the berries turned red, they were called aqpiksait. During the summer they were simply called aqpiit. Aqpinnaquitit, aqpiqutit, and nakait are the words for the stems and leaves. The good: This food is low in Sodium. It is also a good source of Dietary Fiber and Vitamin E (Alpha Tocopherol), and a very good source of Vitamin A, Vitamin C, Vitamin K and Manganese.